I am trying not to borrow too many books from the library but I recently had to pick up a book for an upcoming book group meeting and ended up with a few others that sounded good and just what I need to get me back into a my reading groove. 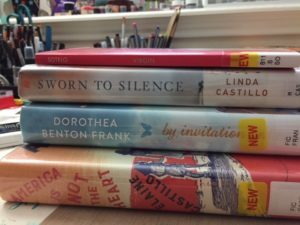 The first book I checked out is Sworn to Silence by Linda Castillo. This is the one for my August book group meeting. I have read one of the books in the series, actually I listened to it on audio, and I liked it quite a bit so I was excited about this one. I have started it and so far I’m really enjoying it. I picked up Virgin a poetry book by a new to me poet, Analicia Sotelo. I haven’t picked up a poetry book in a couple of months. Dorothea Beaton Frank is a bestselling author and I know quite popular but I haven’t read any of her books. By Invitation Only sounds like a good beach read type book and could be just what I need. The last book is America is Not the Heart by Elaine Castillo. I’ve seen this book mentioned quite a bit around blogland and immigrant stories are always of interest to me so I had to add this to my bag. What do you think of my borrowed books? Have you read any of these? I hope you all have a fantastic weekend. I’m so excited because one of my best friends is going to be in town and I’ll get to see her. Yay. More book talk soon. Sworn to Silence is a big favorite of mine. Actually the whole series. I’ve recently read the latest, #10, and loved it. Hope you enjoy them all, Iliana!